Just because we may want something to be a certain way does not necessarily make it so! Some people, for example, arguing that anthropogenic climate change is not a real possibility, given the weight of scientific evidence stacking up in support of this phenomenon, may beholden to a certain notion as to how they want the world to be, rather than actually how it is. Nature does not function according to their rules apparently and therefore the “inconvenient truth” of increased CO2 levels in the earth’s atmosphere (through burning hundreds of millions of years’ accumulation of organic matter in the form of fossil fuels, over the last 3 centuries) may be discounted as having anything to do with global climate change. As individuals we might all be prepared to embrace certain truths but deny others and I accept that I am no exception to this fact. For example I have liberal, mildly lefty green political tendencies and vote accordingly as and when the opportunity should arise and funnily I don’t recall ever having voted for any one who has got into parliament to represent the constituency that I have found myself living in at the time! As much as it pains me I have to accept that most other people in my constituency do not see the world as I see it and are (given our first past the post electoral system) in the majority. Given the weight of this evidence then how can I continue to hold fast to my views when so many think differently? I suppose it’s to do with belief, personal experience, conscience and a certain amount of bloody mindedness. For a climate change denier then it’s likely to be the same combination of factors that makes them holdfast on to their own view rather than accept the influence or persuasion of others. However in this blog I would like to introduce two entirely neutral concepts that may help climate change sceptic and lefty tree hugger alike find a way forward together in the same world (even if it’s not the reality either of us wish to find ourselves living in). Neither concept may solve all the World’s problems in one or several thousands of goes but they have certainly helped me become a better forester and exercise a little more patience in my professional practice and private life. Many governments, governmental organisations and Non-governmental organisations around the world have since adapted this definition of PP to their own ends but for a national and international perspective on the development of a common definition for PP one could do much worse than take a respective look at the HSE webpage on the “United Kingdom Interdepartmental Liaison Group on Risk Assessment’s (UK-ILGRA) 2002 analysis (http://www.hse.gov.uk/aboutus/meetings/committees/ilgra/pppa.htm#ref3) and UNESCO’s 2005 publication by the World Commission on the Ethics of Scientific Knowledge and Technology (COMEST) (http://unesdoc.unesco.org/images/0013/001395/139578e.pdf) . In the context of forest management there is little that I do that is truly new to the discipline or that may be perceived to be harmful on a grand scale to the woods that I help to manage. The precautionary principle is thus not something one would imagine being deployed regularly in my daily practice but it is infact there in my approach. Not being in a hurry to intervene where intervention may be perceived to be necessary (e.g. to fell a tree that’s not growing straight, to cut a ride because the vegetation is getting coarse and long) is part of a precautionary approach. The overgrown ride may have provided blackcurrants, cover for ground nesting birds and connectivity for dormice between different compartments or stands within the woodland. To have cut it back at the wrong time of year would have meant a loss in the potential for all these things. Accepting change as well as invoking change in a management approach is crucial to long-term sustainable care and utilisation of a woodland resource. 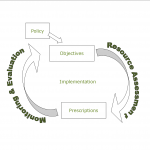 In parallel with the precautionary principle the adaptive management approach allows for change to take place in a controlled way and at a rate that is sustainable for the resource type and ideally for the humans managing it. A clearfell option would be totally inappropriate for a smaller site which may require a selective felling, continuous cover approach for management in order to gain a viable timber crop whilst maintaining woodland characteristics. Standing back and looking at what’s happening and why is a key part of an adaptive management approach. The increase in tree based pests and diseases in the UK over the last 40 (eg Phytopthora, Ash Dieback, Dutch Elm Disease, Asian Long-horn beetle) or so years has been well documented and attributable in part to global movements of timber and tree species (after fossil fuels, wood is the next most traded physical commodity – by weight and volume – in the world) as well as trends in global climate change. Some of these have or might have catastrophic impacts potentially, on tree populations and/or timber production unless one has an adaptive management approach that can deal with these situations and apply appropriate and timely responses as they arise.